The infamous 1996 version of H. G. Wells’ The Island of Dr. Moreau, which starred Marlon Brando and Val Kilmer, has gained a justified reputation as simply one of the worst films of all time (for the record, I find the film very entertaining on a campy level!). 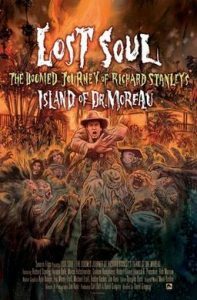 Directed by David Gregory, Lost Soul takes viewers behind the scene to witness the outrageous antics that led to this filmic disaster with fascinating and revealing interviews featuring original director Richard Stanley (Hardware) and assorted members of the cast and crew. Stanley, an eccentric visionary and direct descendent of famous British explorer Sir Henry Morton Stanley, got fired on the set three days into filming, disappeared into the jungle for a while and was replaced by established director John Frankenheimer (The Manchurian Candidate). Believe it or not, Stanley later secretly returned to the set in full disguised as a Dog Man extra! The production as a whole was plagued by overblown egos among the cast, a director who just about everyone disliked and a series of natural disasters. Lost Soul had its world premiere at the 2014 London FrightFest Film Festival. Other recommended documentaries that chronicle troubled movie productions include Burden of Dreams (1982) about the making of Werner Herzog’s Fitzcarraldo and Hearts of Darkness: A Filmmaker’s Apocalypse (1991) about the making of Francis Ford Coppola’s Apocalypse Now.